An elegant app displaying your favorite photos in your chosen area of the screen whilst you are working with other software. Photo Window is a slideshow that displays pictures in a user-selected area of the screen. 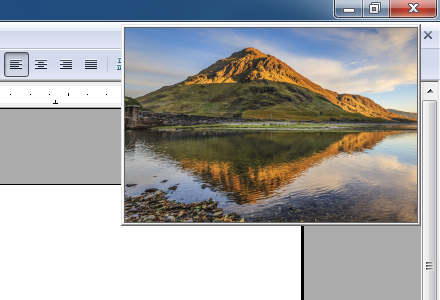 Photo Window is always viewable on top of all the other windows on the screen, allowing the user to glance at the pictures while working with other software. The displayed images are preselected from local media (e.g., the hard drive, memory card, etc.) or downloaded from several Internet galleries. Photo Window can be fully opaque or semitransparent. 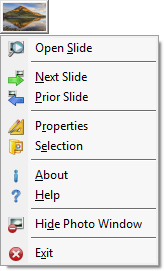 It hides the current slide when the cursor hovers over it and displays it again when the mouse is moved away from the slideshow area. This allows the user to see the content of the window behind the Photo Window slideshow and work with it without repositioning either of them. Computer users often have unused areas on their screens. Such areas are ideal locations for the Photo Window slideshow, which can be located anywhere on the screen and resized appropriately. Photo Window automatically changes the slide after a preselected period of time has elapsed or by a user command. Unobtrusively displaying the user's selected images in, Photo Window encourages quick, momentary breaks that refresh the user and help him/her stay focused. In addition, Photo Window has a native all-screens power viewer designed to perform extreme zooms on the images utilizing all graphic hardware resources and allowing for the viewing of the tiniest details of one’s photos. The Viewer can also play videos and show documents. Photo Window is Windows 10 compatible and certified software, as well as Windows 8.1, 8, 7, Vista and XP. See the Photo Window compatibility seals. Photo Window can be resized from 1 to 999 pixels and placed anywhere on the screen. Photo Window can behave as a normal window, or it can be viewable on top of other windows on the screen, optionally fading when the cursor hovers over it. 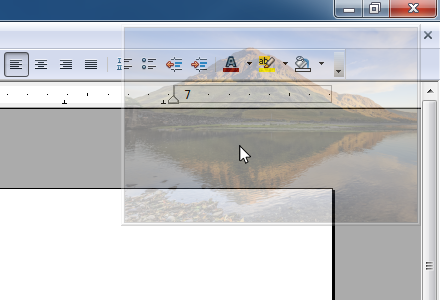 This allows the user to glance at the displayed slide while working with other software, and at the same time see and interact with the window behind it. Photo Window never interrupts the user and their work! Photo Window can be positioned at any location on the screen by dragging it with the mouse. Use the menu of the software to control it. 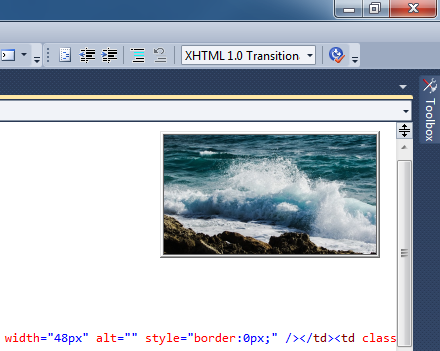 Photo Window will display your favorite photos from your computer or an Internet image gallery to bring you relaxation and pleasant feelings while you work with other programs on your computer. 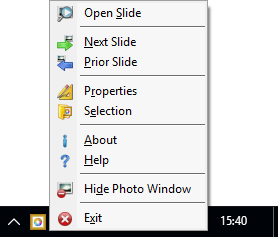 Use the Viewer to open the current slide for viewing. If the slide is an image, the Viewer will allow you to perform mega zooming-in on it, if the slide contains video, the Viewer will allow you to play it, and if the slide contains a document, the Viewer will display it for reading. When purchased with a thematic design set, Photo Window comes with two DVD discs, including a blank one for storing your photos and videos. The thematic box sets can be made into a thoughtful gifts that captures memories and shares them in an elegant way. Visit the Photo Window Gift Idea page for more details. 03:01:31 You've done an awesome job on a seemingly unnecessary product... I mean that as a compliment. Generally, something like this doesn't get a lot of attention and you've done a very nice job of it. If I might suggest; I have found it most amazing how well this works (actually MyLovely that I was working with) when you load it with flash cards and keep it on top. Even if you don't pay attention to the flash cards, the information sticks in your head. Thank you for an awesome product. 14:24:20 Photo Window is Exactly what I've been searching for. A mini slideshow app where I can look at recently taken pics while working on other projects. Thanks! Great job!! !